For a moment, Kong thinks that the book tells the story of his life, and he feels something like a great breath of air expanding him. He imagines a story that will crack the rigid edges of what he knows. Then Kong sees a photograph of Fay Wray, his King Kong costar, on the book’s cover. He is disappointed, but not all is lost. Bob explains that the book’s prologue is a public letter to Kong. Nobody has written Kong a letter before. Surrounded by Bob’s other monster movie memorabilia, including the alien from Aliens and casts of Jeff Goldblum’s various incarnations upon evolving into The Fly, Kong relishes the individual attention, listens carefully. But he quickly realizes that the letter is not meant for him at all. It is a publicity stunt, all sly winks and stylized pirouettes. Fay Wray references a magazine cover displaying an artist’s depiction of Kong. You were in an easy chair and wearing slippers, she writes. There were banana peels on the floor, our film on the television. She delights in spotting a framed photograph of herself on the hand-drawn table. She quips that she’d mail this letter to Skull Island, Kong’s home in the movie they starred in together, except that she doesn’t have his zip code. The joke is that Kong’s existence is inseparable from the film. Of course, he lives on Skull Island. Of course, he keeps a photo of Fay Wray close by. He is Kong. He has no other name, no other identity. But Fay Wray warns him, as though he were a jealous child, that much of her autobiography has little to do with him. She is not Ann Darrow, her signature reminds. She is “Fay,” and that is her final word. If Kong had tear ducts, would he shed tears? He thinks not. He is tough—as all creatures like him must learn to be. Fay Wray’s declaration in her letter that she respects him but will not publicly declare her respect because others would not understand (because they believe he truly meant to harm her) cannot injure him. Her likening herself to a flower he plucked the petals from cannot rile him up. For starters, what remains of Kong is nothing more than an 18-inch steel skeleton. The rubber, latex, rabbit fur, and glycerin that once made up the skeleton’s flesh rotted away long ago. The chilled air in Bob’s basement blows through him as though through the comb of a harmonica. Gone is the wooden bust with its oversized head: eyeballs 12 inches in diameter, fangs larger than the letters in a marquee sign, skin cut from the muscles of bears. Gone is the full-scale leg—there was only ever one—that once stomped on the so-called natives of Skull Island, flattening them like bugs. Gone too are the full-scale arms—both for the right side of his body—that once freed Wray’s character, Ann Darrow, from ropes binding her like a threaded button. Arms that later delivered her to the top of the Empire State Building, away from hordes of angry men. It’s a strange feeling even now, decades after Kong’s other parts were destroyed or recycled, to be singular. One body. One Kong. In some ways, he is more whole now than he was back then—all his parts made to different scales, nothing fitting together. That fractured, impossible body. Like James Whales’s monstrous reimagining of Shelley’s creature. He will not let Fay Wray get to him; she is not his maker. She is not responsible for his troubled fate. The character Carl Denham’s famous line from the film, “It was beauty killed the beast,” was false. If there is a rightful target for Kong’s anger, it is the men who cobbled him together: Merian Cooper, who dreamed him, and Marcel Delgado, whose hands built him. These men once set the 18-inch Kong into the outstretched palm of one of the colossal hands and laughed and laughed, while Kong, in his scattered being, suffered vertigo. Sometimes he can still feel the massiveness of those huge limbs and that immense head, imagines that he can unleash their power. He pictures himself unhinging his jaw and releasing a roar that will bring Bob’s house down, crumbling the basement walls with his fists. Then he feels guilty. Bob is good to him and the others. What remains of Kong’s body might have been melted and recycled into a film canister if it hadn’t been for Bob. Anyway, the truth is that his minuscule steel fingers cannot even dent the rubbery, hairy legs of the prostrate body of the wolf-man from An American Werewolf in London. Kong never could control his various parts. He was born a puppet. He understands all too well that he cannot shed his costume. He understands that he cannot play any character other than Kong. He has less autonomy than even Shelley’s creature, who could at least operate his conglomerate body. Kong cannot lift a finger of his own volition. His every movement has been orchestrated by humans. That long-gone huge head of his: it housed three men who tinkered inside to unhinge his jaw and roll his eyes. Those long-gone gigantic arms: one was mounted to a crane and rolled around the movie set, the other raised and lowered by a lever. None of this stops Kong from dreaming. In his imagination, he is the giant ape he appears to be in the movie, only his body is his, its every movement controlled by his own will. And what a body it is! Capable of tearing down buildings. Gnashing humans in its teeth as easily as pieces of popped corn. Revenge is tempting. Like Shelley’s creature destroying Frankenstein’s bride-to-be. A fitting retribution for Frankenstein destroying the companion he promised to make for the lonely, rejected creature. But in Kong’s dreams, he does not act out the script written for him. Here’s what happens: Fay Wray doesn’t scream at him. She instead twirls around in her white dress, trying to draw his attention. A dandelion’s bloated seed head shimmying in the wind. But Kong, he ignores her, stomps right past. Kong climbs the Empire State Building without Fay, and this time, when he reaches the top, he doesn’t stop. He continues climbing, the weight of his body supported by the air, an invisible ladder. He climbs up through the clouds where airplanes and bullets can no longer touch him. But he is not alone up there. He does not drift away on a sheet of ice like Shelley’s creature. All the great, beautiful monsters of the world are with him. They punch through the frail human sky, climb toward the sun. 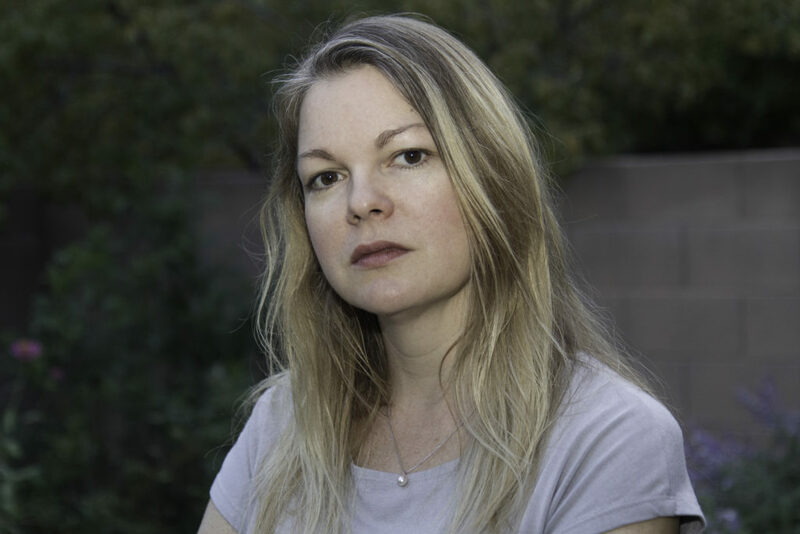 Michelle Ross is the author of the story collection There's So Much They Haven't Told You (Moon City Press 2017), winner of the 2016 Moon City Press Fiction Award. Her fiction has appeared in Cream City Review, the Common, Gulf Coast, New World Writing, Paper Darts, and other venues. She is fiction editor of Atticus Review and a consulting editor for the 2018 Best Small Fictions Anthology.